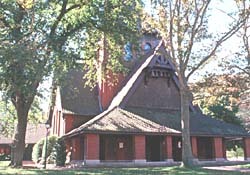 The All Souls Church and Parish Hall, sanctified in 1896, are at the pivot point of Biltmore Village's fan-shaped plan, opposite the train depot and tapered plaza, so passengers arriving by train had an exaggerated perspective view of the church. The powerfully composed and beautifully detailed church was one of architect Richard Morris Hunt's last works before his death in 1895. 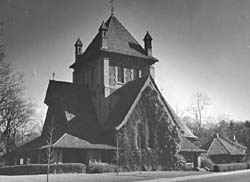 All Souls, one of three buildings designed by Hunt in Biltmore Village, is also Hunt's only surviving intact church. The exceptionally fine Romanesque Revival church exemplifies Hunt's idea that the short-nave, Greek cross offered a better church plan than the more usual, long-nave, Latin cross, for it allowed all the congregation to see and hear the service. The compact edifice features a square tower rising at the crossing, transepts, a boldly curving apse, pebbledash wall surfaces, brick and wood trim and expansive tile roofs. The Parish Hall features the same materials as the church, but its design is considerably different. The one-and-one-half story building exhibits a hipped roof with wide eaves, dramatic dormers and trefoil trim, and a high brick foundation wall. In 1954, a portion of Swan Street was closed and a one-story classroom wing was built which joined the Parish Hall to the church, creating an asymmetrical courtyard. Vanderbilt selected the brass electroliers and lectern to complement the pulpit, altar and choir stall furnishings designed by Hunt. The stained glass windows were designed and executed by D. Maitland Armstrong and his daughter, Helen, of New York City. Additional windows were installed in the mid-1990s. Vanderbilt was said to have been a deeply religious man and assumed complete leadership and control of church affairs; he voluntarily paid all fees incorporated with the church and then gave it to the Diocese. The congregation was without any financial responsibility until Vanderbilt's death in 1914. Shortly after the parish was organized, Vanderbilt traveled to Wheeling, West Virginia, where he enticed the rector of St. Matthews Church, Dr. Rodney Rush Swope, to come to All Souls Church and Parish Hall. The church congregation was small but active in the life of the community, operating the village school and hospital for a period of time. Continuing as a parish church after Vanderbilt's death in 1914, All Souls was designated the cathedral of the Western North Carolina Episcopal Diocese in 1995. The All Souls Episcopal Church and Parish Hall are located on 2 Angle St., at the corner of Hwy. 25 (Hendersonville Rd. ), within the Biltmore Village Multiple Resource Area. A docent is available during visitors' hours, Monday-Saturday, 11:00am to 4:00pm. For more information call 828-274-2681 or visit the church's website.